As August 13 marks International Lefties Day, we wanted to dedicate a blog post to all our left-handed Conid writers out there. You might have read several articles today which claim that lefties or so-called “southpaws” are much more inventive, dreamy and have more imagination than their right-handed colleagues. While only 10% of the society is left-handed, it is said that left-handed people excel in solving complex problems, which might explain the high number of left-handed Nobel Prize winners, writers, artists, musicians and even presidents of the United States. However, lefties sometimes face a lot of difficulties using tools that seem very straightforward to right-handed people, such as sauce ladles, scissors, spiral notebooks and last but not least: fountain pens. But is this latter fact actually true? Left-handers are often excellently adapted to these everyday inconveniences, and this mostly counts for their handwriting as well. Cursive western writing progresses from left to right, which means that left-handers need to push their hand forward instead of dragging it. This is why they tend to “dig” into the paper more often with a fountain pen, since these are more difficult to push than to pull because of their sharp nib. In addition, lefties often end up with ink stains on their hand palms, since fountain pen ink is known for drying a little slower. In an attempt to overcome these ‘fountain pen-issues’, left-handed people usually write at quite a peculiar angle. Regarding these angles, we can distinguish between so called “over-writers” and “under-writers”. Over-writers turn their left hand over their written text to the right, so that they write parallel with the writing line. This avoids most smudging and gives lefties a better overview to what they have written earlier. Under-writers however, hold their hand below their written text and often turn their writing paper slightly to the right, so that the pushing pressure on their pens is minimal. But how do these techniques influence a lefty’s pen- or nib choice? Although many people think fountain pens are just not suitable for left-handed writers, choosing the right pen, nib and ink might make all the difference, so that a fountain pen could become the perfect companion for every lefty out there. Together with many other resources, our Conid nibmeister recommends using round pen tips and choosing a nib that is not too fine, to avoid pushing the pen into the paper too much, or facing an uneven flow of ink. Next to that, it is recommended not to use flexible pen nibs, since they are designed to create lines of various thickness when you are pulling the pen. Pushing the pen causes the tines of the nib to restrain the ink flow which causes damage to your nib, but also might cause ink splattering. Furthermore, you might consider using fast-drying ink in order to avoid any chances of smudging. 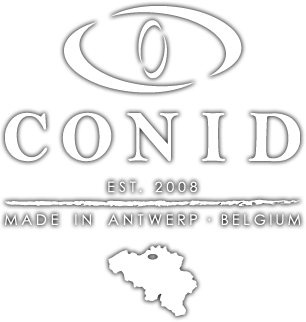 At Conid, all of our pen nibs are ground upon your personal preference by our nib meister. When ordering a Conid Bulkfiller, you can mention your preferred thickness and tipping size according to your writing style. We also dedicated a separate webpage to our nibs, on which you can find further information about any kind of possible nib grinding and material. Please do not hesitate to contact us if you have any other questions regarding our nibs at our contact page.